The best way for young children to learn is through play. If your child is having fun and is fully engaged in an activity, they will learn new things without even realising it. As your child's early literacy skills develop, they will move naturally from learning the letters of the alphabet to learning how these letters go together to form words. Help your child to become familiar with words and the sounds in words by playing some of these fun free word games with them. Most of these free word games can be set up easily with very little preparation or additional materials. Many can be done wherever you find yourself - in the kitchen, in the bedroom, in the bath, in the car, waiting for the bus. 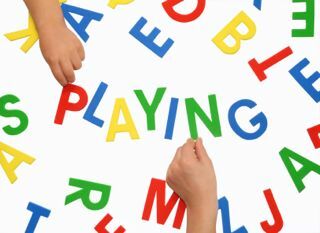 Best of all, playing these free word games is a wonderful way of spending quality time with your little one, while also helping them learn essential skills. A real win-win! Firstly you could try some free word games to practice phonics. They are all about recognising sounds in words, blending sounds to make words and having fun with rhyming words. These free word games will help to increase your child's awareness of sounds in words which will eventually help them to read and spell. Ultimately, to make sense of what you read, the words need to flow together. If every word is sounded out, the meaning is lost. Here are some word recognition games which will help your child to start to recognise whole words. This will eventually enable them to become a fluent reader. The great thing about playing the free word games described here is that you get to choose the words you play with so you can choose special words which mean something to your child - their favorite food or beloved toy. They are sure to be more motivated if they discover the words you are showing them are worth reading. To become a proficient reader your child needs to have a strong vocabulary. Vocabulary plays an important role in learning to read since children use words which they have heard to make sense of the words they see in print. Once they are reading independently, children need a good vocabulary in order to really understand what they are reading. Most vocabulary is learned through conversations with adults, listening to read aloud books and independent reading. However, you can also play an important role in helping to expand your child's vocabulary by playing these vocabulary games with them. Help them to decipher the meanings of words themselves while reading and play fun games to introduce them to new words. For even more ideas of free word games to play with your child, have a look at the activities below which my two young children have enjoyed. These activities are quick to prepare and great fun to play! Follow the links and you will find step-by-step instructions for each activity which will help to develop your child's phonics skills and word recognition ability. Most children love to crack a code and discover the secret hidden message. Mine are no exception. This game provides lots of opportunities for literacy learning and can be customised to your child's age and current obsessions. This simple game involves lots of running around searching for things so was a big hit with my energetic four year old. Your child reads a three letter word on a card and searches for that object. Try playing this simple fishing game with your child or children. It was a perfect way to simultaneously practise letters with my 3 year old and words with my 5 year old. Both boys enjoyed themselves and it was quick and easy to set up. Your child reads a word on a card and then posts it into the postbox with the correct image on the front. With lots of running between postboxes they will get a good workout while also brushing up on their literacy skills. Being good at recognising words will help your child become a fluent reader. In this simple activity your child practices recognising letters and words while sticking the words of a Valentine's poem onto a decorated piece of card. Have fun playing these free word games with your child! Why not find out which literacy activities for early readers are most popular with visitors of this site.